Last week, America observed a new and disturbing Thanksgiving tradition: In preparation for Black Friday, the Occupational Safety and Health Administration issued safety guidelines for stores in the hope that this year no one will be bruised or maimed while trying to get their hands on a slightly discounted Elmo doll. OSHA has been sending out its tips for crowd management since 2008, when shoppers broke down the door to a Walmart in Valley Stream, New York, and an employee was killed in the ensuing stampede. 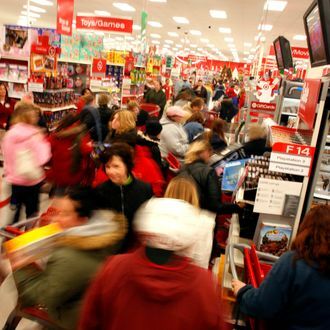 Thankfully, there haven’t been any other Black Friday–related deaths, but despite increased efforts to control crowds, dozens of shoppers are still injured every year in the consumerism-fueled chaos. There were occasional post-Thanksgiving scuffles between shoppers over the years — the Detroit News reports that in 1998 a Michigan woman attacked a sales clerk who rolled her eyes at her, and in 2000 two women in Mississippi struggled over the last $39.95 scooter at Walmart. But the violence seemed to escalate in the mid-2000s as retailers started offering more enticing deals. In 2005 several people were hospitalized in Michigan and New Jersey after being trampled in big-box stores. The next year Walmart employees were pinned against stacks of merchandise in Ohio, a Virginia man hit another customer in a Best Buy, and in California nine people were injured when a mall dropped gift certificates from the ceiling. Following Walmart employee Jdimytai Damour’s death in 2008, the store was fined $7,000 by OSHA for not doing enough to protect its workers from “crowd surge or crowd trampling.” Incredibly, Walmart spent more than $2 million to fight the fine in court in an unsuccessful effort to resist further government meddling over its safety procedures. Since the incident, the industry has released its own annual guidelines for controlling holiday crowds, which aren’t much different from those issued by OSHA. Though Target employees managed to free Keith Krantz, the man seen being trampled in the video, he collapsed in the store and was hospitalized for his injuries. In 2011 there were multiple reports of unruly customers being pepper sprayed or tased, and three bomb threats on Walmart stores. This year police have already caught a man who threatened to set off a bomb at a Long Island Home Depot on Black Friday, but with stores opening their doors on Thursday to Americans fighting their urge to take a tryptophan-induced nap, it seems unlikely that this year’s shoppers will emerge unscathed. People, it’s just not worth it — even for a $2 waffle iron.